This Panoramic lens use two fisheye lenses to capture a seamless, 360 degree view of the word-all with a single tap. Take a shot, add your favorite filters and masks, then share to social media with the app. Sharing memories has been so much fun! ✦Innovative Panoramic Lens: Create fun shots and feel the new to shoot experience. ✦Quick Editing: Convenient photo editing with unique filters and a range of customized stickers. ✦One-click Sharing: Use the App to instantly share your 360-degree pictures on social media websites like Instagram, Twitter or Facebook. 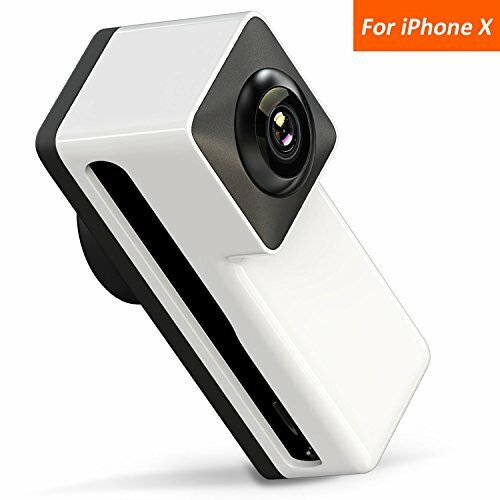 ✦Elegant Design: Stylish appearance, a cool clip attachment for your iPhone X. 1.For the first time use, please search"PanoClip" in App Store to download the companion app and activate the app. 2.After activating the app, attach this lens onto your iPhone X. 3.Open the app to shoot photos. While shooting, tap the Shoot Button and keep your iPhone still (5 seconds)until the shooting has been completed. 1.This lens only supports to take panoramic photos. It can't shoot 360 degree video. 2.Please take off your iPhone X's case before you snap this lens onto your phone. At Comsoon, we back this Lens with 12-month warranty. If you meet any questions, please contact us, we will fix your issue within 24 hours. If you have any questions about this product by Comsoon, contact us by completing and submitting the form below. If you are looking for a specif part number, please include it with your message.